This year is the centenary of the building of the steam ship T.S.S.Earnslaw. Built in 1912, in Dunedin, by J.Mcgregor and Co it was dismantled and transported by train to Kingston - a small town on the southern tip of Lake Wakitipu. Here it was put to service (after they put it back together again!) as a cargo ship, livestock carrier and passenger vessel between Kingston, Queenstown and Glenorchy. In the early days there were few roads so the use of a steamship was essential. 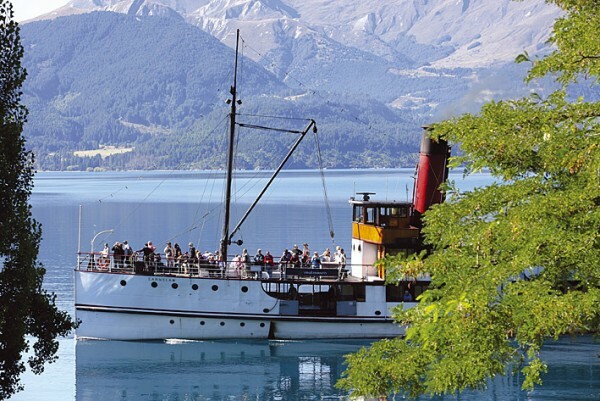 Now, this graceful 'Lady of the Lake' is one of Queenstown's more sedate tourist attractions. 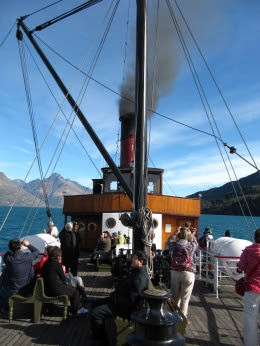 The puff of black smoke and the toot of her whistle are as much a part of Queenstown as the snowy Remarkables or the gondolas that traverse Bob's Peak. I have fond memories of my last voyage upon her. It was August 1991 and hubby and I were wrapped up against one of the worst winters in hsitory. The occassion - our honeymoon. I can't share any of the photos as they are the old fashioned printed ones! Despite the cold, the scenery was breathtaking. There is a magical quality to steaming along in an old boat trimmed with wood and gleaming brass. It is the largest coal-fired steam ship in the Southern Hemisphere. Film appearances: In 2008 a brief appearance as an Amazon River Boat in Indiana Jones and the Crystal Skull. Parts of her were the basis for the S.S.Venture in Peter Jackson's King Kong. I intend to go back to that site and see what else I can unearth. There are some stories of people's memories of the Earnslaw which I'm sure will make fascinating reading. They might even inspire a story or two from me. As you can imagine there were plenty of events in Queenstown, Kingston and Glenorchy to mark the Lady's 100th birthday. In Dunedin we had our own festival to mark the occasion. A steam train was brought down from the North Island that offered short rides to Sawyers Bay and back, as well as a day trip to Invercargill. 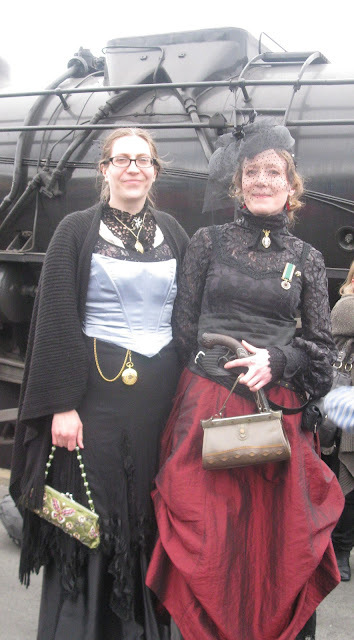 There were also several events organised by our very own steampunk group: The Grand Gadgeteers. Two of my writing friends are part of this group and I joined them at the Railway Station on Saturday afternoon. The place bustled with train enthusiasts, parents, children and a small group of strange, but beautifully dressed Gadgeteers. Ruth, aka Miss Prudence Winterbottom. The next historical event on the calendar is a Victorian Fete at the end of November. A train is running up to Oamaru for the day - the culmination of a whole week of Victorian events in this beautiful town, reknowned for its whitestone Victorian buildings. 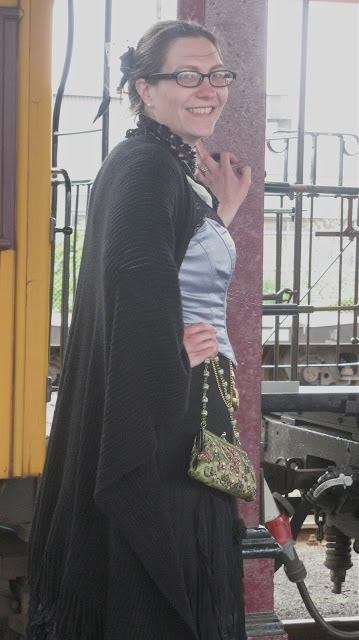 My friends have encouraged me to dress up in full Victorian regalia, but being of a short, plump disposition I fear I will look like none other than Queen Victoria! Mmmm, I can't decide if this is a good thing - or not. Regardless of my attire I intend to enjoy the day. No doubt you will hear all about it in due course. I was thinking of you when I heard about all these Victorian events. We were also in Queenstown around 1991 and did the Earnslaw trip with our young daughter. Fabulous. We've certainly been spoilt with these historic events lately. Just perfect for me! A trip on th Earnslaw is on my bucket list. The last time we were down south it was being serviced the day we were in Queenstown. Oh, how disappointing. I definitely recommend you make it there one day. Oh, how lovely! New Zealand looks like such a gorgeous country, and that ship only adds to the beauty. Yes, dress up! People of all shapes and sizes have existed throughout history, and you will have lots of fun! 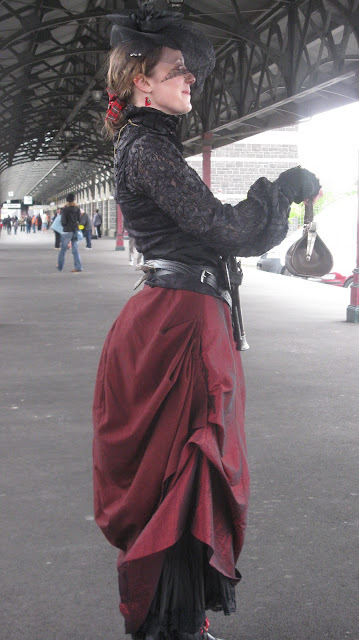 I'm going op-shopping next week so I will see what turns up that can be fashioned into a Victorian costume. If it all comes together I'll post photos. And yes, NZ is gorgeous, and I'm not a bit biased either ;) You'll get to see more of it in the Hobbit movie.